One of my family's Halloween traditions has been to tune into Disney Junior to watch their annual broadcast of the animated television special SPOOKLEY THE SQUARE PUMPKIN based upon the bestselling book series by Joe Troiano. Having cut our cable subscription, my kids were disappointed that they wouldn't be able to see this beloved Halloween special this year. They were so excited when a Spookley plush pumpkin arrived at our house along with the television show on Blu-ray. 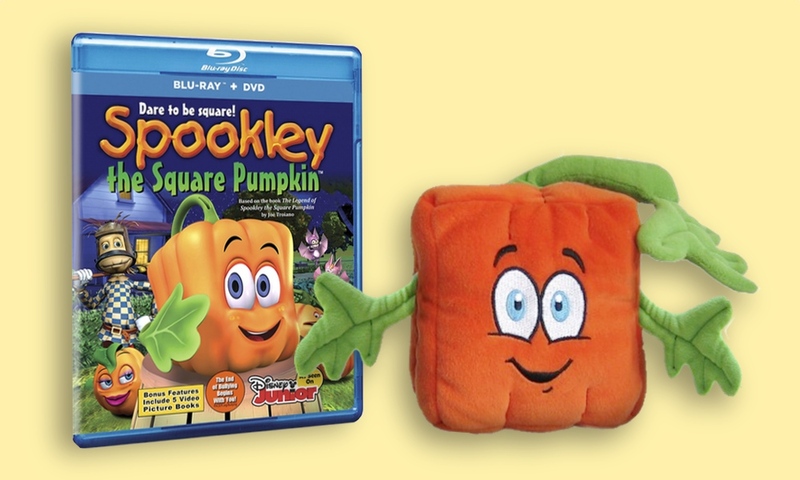 This Halloween season, for the first time ever, SPOOKLEY THE SQUARE PUMPKIN can be purchased in a Blu-ray/DVD Combo pack. It is available at retailers across the United States as well as on Amazon.com. This animated television special will make a great addition to any home video library that you will want to pull out and watch together as a family every year at Halloween. It is spooky fun that isn't scary so all ages will enjoy the show. SPOOKLEY THE SQUARE PUMPKIN tells the story of a square pumpkin living in a round pumpkin patch on Holiday Hill Farm. Although Spookley initially faces ridicule from his fellow patch-mates, he goes on to save the day during a terrible storm. As a result, all the pumpkins in the patch learn that the things that make you different make you special. To share my family's excitement about being able to watch SPOOKLEY THE SQUARE PUMPKIN on home video, A Geek Daddy also is giving away a prize pack featuring a square pumpkin plush toy and the Blu-ray + DVD Combo Pack of the Halloween special. Throw your name in the hat for a chance to win this great giveaway by completing the entries in the rafflecopter form below before Wednesday, October 18 at 11:59 pm ET. Must be a US resident over 18 years old to be eligible to win. Good luck! October is National Bullying Prevention Month and Spookley is serving as the official Spokes-Pumpkin for PACER'S National Bullying Prevention Center. PACER is a non-profit organization based in Minneapolis that provides resources to address bullying as a serious community issue that impacts education, physical and emotional health, and the safety and well-being of children. For more information about Spookley's activities please watch the PSA below and visit PACER.org/Bullying. Bullying is a central theme of SPOOKLEY THE SQUARE PUMPKIN. In a world where the only good pumpkins are round pumpkins, Spookley is teased because of his square shape. Shunned by the other pumpkins, Spookley is befriended by Edgar, Allan and Poe, three hilarious spiders, who convince him that, square or not, he has a right to be the Pick of the Patch. But Big Tom and Little Tom, the pumpkin bullies in the patch, continue to tease and taunt Spookley. Encouraged by kindly Jack Scarecrow and his bat sidekicks, Boris and Bella, Spookley tries his best, but he isn’t sure he has what it takes until a mighty storm threatens Holiday Hill Farm. When the storm blows the round pumpkins across the patch towards the raging river, Spookley realizes it is up to him and his square shape to save the day. The Legend of Mistletoe and the Christmas Kittens. To learn more about Spookley and his friends at Holiday Hill Farm, where "Every Day is a Holiday" visit holidayhillfarm.com which has FREE coloring book and activity sheets to download and music videos to watch including Halloween is Fun and Bugs! I Love 'Em All. Disclaimer & Rules: A Geek Daddy has not been financially compensated for this endorsement or hosting the giveaway but was provided the same items being provided as a prize for personal use. The prize is provided by Bounce Creative Group and A Geek Daddy is hosting the promotion as a benefit to our readers. Must be a US resident over the age of 18 to participate. One entry per mailing address and winner will be randomly selected from all eligible entries. If you have already won this prize through another blog participating in this promotion, your entry will be disqualified. By participating in this promotion you waive any liability of any kind against the publisher of this blog. Winner is subject to eligibility verification. No P.O. Boxes allowed for delivery of the prize. Bounce Creative Group will be responsible for shipping the prize to the selected winner. A Geek Daddy is not responsible for delivery of the prize. This looks really cute. I'm betting our granddaughter will like it. I will have to ask my daughter if they watch this show. Sure her kids would enjoy watching the square pumpkin. This looks like a sweet movie. My daughter would probably like it. I have never seen or heard of this character. I think my nephew would love this and I love to spoil my nephew! Aw this sounds like a really cute DVD for kids this Halloween, isn't Spookley adorable. My daughter and I like the Spookley Square pumpkin. This looks like such a fun movie for Kids. Perfect Halloween gift idea! This would make a nice addition to my family friendly Halloween movies list. Spookley is just adorable. This looks so cute. I will have to share this with my friends that have little ones. 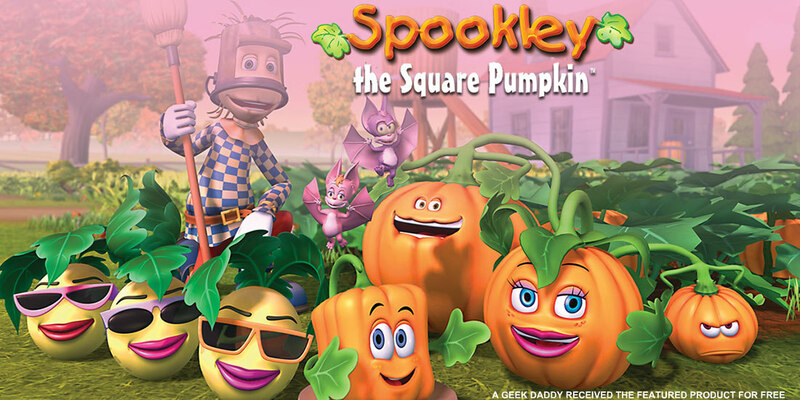 I have never heard of Spookley the Square Pumpkin. It sounds like a fun Halloween show for kids to watch. Looks like such a cute movie for kids. Thanks for sharing, it would be fun to watch this as a family. I like how it has some positive messages in the movie. This will be an awesome DVD to break out every Halloween. I like having a few Halloween movies that we rewatch as a tradition. I remember the book Spookley The Square Pumpkin. It was super cute but also had a really good point. Spookley the square pumpkin sounds so fascinating. I can see that beneath the fun, there is an undercurrent of poignancy too. I love that there are life lessons included in the movie. It would be a good film to watch with the kids. Oh my gosh, I had forgotten all about Spookley!! We have watched it every year since it first aired, and had it on the DVR. My daughter would watch it in the summer! Ha. I've never heard of Spookley before. But we love holiday videos at our house so I'm going to have to pick that one up. Thanks! I haven't heard of this before! I love that there are life lessons included in this. Super neat. I'll have to buy this for the grand kids. I also can't wait to see it, lol. We are a movie loving family.